Dolphin Tale is a 2011 American 3D family drama film directed by Charles Martin Smith , from a screenplay by Karen Janszen and Noam Dromi and a book of the same name. It stars Nathan Gamble, Harry Connick, Jr., Ashley Judd, Kris Kristofferson, Cozi Zuehlsdorff in her film debut, and Morgan Freeman. The book and film are inspired by the true story of Winter, a bottlenose dolphin that was rescued in December 2005 off the Florida coast and taken in by the Clearwater Marine Aquarium. Winter lost her tail after becoming entangled with a rope attached to a crab trap, and was fitted with a prosthetic one. The film was released on September 23, 2011, by Warner Bros. Pictures; Dolphin Tale received positive reviews from critics and earned $95.9 million on a $37 million budget. A sequel, Dolphin Tale 2 was released on September 12, 2014. 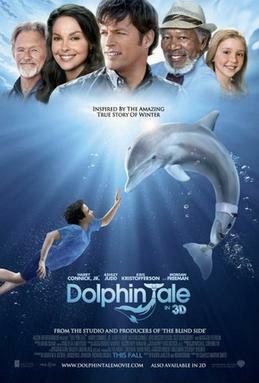 Dolphin Tale is a 2011 American 3D family drama film directed by Charles Martin Smith (his first since 2008), from a screenplay by Karen Janszen and Noam Dromi and a book of the same name. It stars Nathan Gamble, Harry Connick, Jr., Ashley Judd, Kris Kristofferson, Cozi Zuehlsdorff in her film debut, and Morgan Freeman. The book and film are inspired by the true story of Winter, a bottlenose dolphin that was rescued in December 2005 off the Florida coast and taken in by the Clearwater Marine Aquarium. Winter lost her tail after becoming entangled with a rope attached to a crab trap, and was fitted with a prosthetic one. The film was released on September 23, 2011, by Warner Bros. Pictures; Dolphin Tale received positive reviews from critics and earned $95.9 million on a $37 million budget. A sequel, Dolphin Tale 2 was released on September 12, 2014. Inspired by the remarkable true story of a courageous dolphin named Winter and the compassionate people who banded together to save her life.